We’d love your help. Let us know what’s wrong with this preview of An Armadillo in Paris by Julie Kraulis. To ask other readers questions about An Armadillo in Paris, please sign up. Sightseeing in Paris with Arlo the Armadillo. A delightful tour. OK, I wanna say right up front that this is all Kraulis's fault. I had nothing to do with it. She made me laugh. It's all on her. Seriously. How can you not want to read a book with a title like this one? The best thing about it is that it proved to be hilarious and completely up to its promise. The line drawings are splashed with color, beautifully done (quite the artist is our Ms. K), and the story is a real tease. Frankly I had initially thought that the 'Iron Lady' was - no, not Margaret Thatcher, silly - but Lady Liberty. Of course there are two immediate problems with that: Lady Liberty is made from copper (although the framework was iron and designed by someone who played a crucial role in this story! ), and she's not in Paris, she's in New York City; however, as Nicholas Cage's character pointed out in National Treasure 2, Lady Liberty originated in France, and there are copies of her there which might have been made from iron. Maybe. But my initial idea was WRONG, and I'm armadillo enough to admit it! Shame on me since I've actually been to Paris and visited the Iron Lady without realizing it was known by that title! The novel also has a little info page listing some interesting trivia about its subject, so one must be sure to stop by there whilst one consumes one's stuffed croissant. So anyway, you have to figure it out for yourself, just as Arlo the nine-banded armadillo did. I loved this story. I loved the depiction of Arlo which I found endlessly entertaining. Like I said, it's Kraulis's fault, so I'm really, really sorry if she didn't intend that...the hell with it. No I'm not sorry. I laughed my derriere off and I'm proud to admit it! There! Stuff that in your Place de la Concorde n'est-ce pas?! Arlo the Armadillo is from Brazil and he loves to explore. His grandfather has left him a set of journals about the places he has visited. Arlo is following in his footsteps. He begins in Paris where is is seeing all of the sights and anticipating meeting the Iron Lady. He sees the Arc de Triomphe, the Louvre, the Seine, and many other places such as cafes and cathedrals. He ends his journey by meeting the Iron Lady. The illustrations are done in graphite and oils. They are ABSOLUTELY STUNNING! T Arlo the Armadillo is from Brazil and he loves to explore. His grandfather has left him a set of journals about the places he has visited. Arlo is following in his footsteps. He begins in Paris where is is seeing all of the sights and anticipating meeting the Iron Lady. He sees the Arc de Triomphe, the Louvre, the Seine, and many other places such as cafes and cathedrals. He ends his journey by meeting the Iron Lady. The illustrations are done in graphite and oils. They are ABSOLUTELY STUNNING! The excellent use of rich color alongside the black and white makes for vibrant pictures. And the details are amazing. I could reread this book several times just to look at the pictures. This book begins with the words: "Arlo feels it. The twitch in his left claw. The twitch that only stops when adventure begins..." This bit of whimsy follows Arlo throughout the story. I love every illustrations of him, but especially the one of him on top of the car enjoying the breeze as he travels. This is a teaching picture book that would be appropriate most especially for grades 1-5. The paragraphs are a little bit lengthy for the little ones, but they do not bog you down and are well written. Each ones tells you a snippet about something in Paris. Some of the vocabulary will be difficult for the younger crowd, but it is a wonderful learning opportunity. This book is an excellent springboard for learning about France and Paris. I taught elementary French and I would have most definitely used this book in that classroom. I also would have read this book aloud to any of my elementary classes simply because it is an all around excellent and interesting picture book. Because there is so much detail, if reading aloud to a class, I would recommend having it available later for students to read independently. If reading to the younger crowd, it might be best to break the reading up into a couple of sessions. Ahhhhhh! !1 Beautiful Paris! The home of the best croissants in the world, the Arc de Triomphe, Café Gustave, the famous street Champs-Éysées, The Louvre, artists, poets and the beautiful Seine River. Arlo, a little Armadillo from Brazil, is encouraged by his grandfather's journals to go there and explore the splendour and ambiance of one of the most visited cities in the entire world. "Arlo feels it, the twitch in his left claw. The twitch that only stops when the adventure begins..." And begin Ahhhhhh! !1 Beautiful Paris! The home of the best croissants in the world, the Arc de Triomphe, Café Gustave, the famous street Champs-Éysées, The Louvre, artists, poets and the beautiful Seine River. His grandfather's writings urge him on through the wondrous sights, sounds and smells that only Paris can deliver. He wants Arlo to ultimately encounter the number one lady of Paris....the infamous Iron Lady or as she is so affectionately referred to in Paris, the Dame de Fer. After absorbing the flavour of the bustling culture of Paris, Arlo decides to visit a local street market and purchase all the ingredients necessary to pack a perfect picnic to share with this mysterious Iron Lady if she will have it (and him). Will he discover where she is? Who she is? Will she welcome him to her city and finally unveil her true self? You might just be surprised what she is all about. This fun, informative book will open your eyes to the history, the French culture, and the everyday life of those living in the grand city of Paris, France. It will provide access to learning more about the city and especially about the celebrated Iron Lady. The author cleverly inserts a back page. I am very fond of back pages because they give opportunity to dig deeper into the subject matter in the book. Listed there are very interesting and informative facts about the renowned Lady that I am sure both young and old will enjoy. The illustrations are created in soft, muted colour, are whimsical in design, and very appealing to the eye. An Armadillo in Paris was an exceptional story. I loved it! It was most definitely a delight to read. As a homeschool educator, I must say that I could totally develop a lesson plan around this book. There were rich details about the sights and experiences of Paris. I adored the journal entries and the grand adventure that Atlo went on. I got to see and do what he did, which made this reading experience fun. The author did a superb job of connecting the dots, in my opinion. From Brazil to Paris, An Armadillo in Paris was an exceptional story. I loved it! It was most definitely a delight to read. The author did a superb job of connecting the dots, in my opinion. From Brazil to Paris, that was a great way to make the world come alive and I think kids will appreciate that. The illustrations in this book were wonderful and captivating. The content was also just right for young readers. I cannot wait to go on another adventure with this cute, little armadillo. Summary: An Armadillo In Paris is a wonderful guide to the city of lights! It begins with our main character, Arlo, following notes left for him by his grandfather that tell him all the sights he must see in Paris. He goes from landmark to landmark, his whole journey leading him towards finding 'The Iron Lady' who we discover on the last page is also known as The Eiffel Tower. This story is artfully illustrated, uses colorful vocabulary, and gives cultural insight into one of the world's most fa Summary: An Armadillo In Paris is a wonderful guide to the city of lights! It begins with our main character, Arlo, following notes left for him by his grandfather that tell him all the sights he must see in Paris. He goes from landmark to landmark, his whole journey leading him towards finding 'The Iron Lady' who we discover on the last page is also known as The Eiffel Tower. This story is artfully illustrated, uses colorful vocabulary, and gives cultural insight into one of the world's most fascinating cities. Activity: Have students pick one of the landmarks described in the story and do a short research paragraph about it. Once finished they may illustrate their own picture of it. Additional difficulty: have students pick key terms from their paragraph to translate to their French counterparts ie: rue for street or tour for tower. I love the premise of a little armadillo (Arlo) following in his grandfather's footsteps as he discovers Paris for himself. His quest to find the Iron Lady takes him to many famous sites in Paris, each stop accompanied by a journal entry from his grandfather. When he finally reaches his mysterious destination, the illustration is a full double page spread turned vertically for maximum impact. This book is a fun introduction to the city. The back of the book gives a bit more information about eac I love the premise of a little armadillo (Arlo) following in his grandfather's footsteps as he discovers Paris for himself. His quest to find the Iron Lady takes him to many famous sites in Paris, each stop accompanied by a journal entry from his grandfather. When he finally reaches his mysterious destination, the illustration is a full double page spread turned vertically for maximum impact. This book is a fun introduction to the city. The back of the book gives a bit more information about each of the places visited by Arlo on his journey and how each relates to the Iron Lady. You do not have to be a child to enjoy An Armadillo in Paris. It is charming. Delightful! I love it! An Armadillo in Paris is gorgeously illustrated. The illustrations of Paris are realistically and beautifully drawn. Arlo the Armadillo's adventures in Paris cover all the top spots such as the Louvre, the Champs Elysees, and the Arc de Triomphe. He discovers the macarons of Paris which are the colourful, light cookies filled with ganache. He rests on the beautiful Pont Neuf. Arlo has his portrait You do not have to be a child to enjoy An Armadillo in Paris. It is charming. Delightful! I love it! An Armadillo in Paris is gorgeously illustrated. The illustrations of Paris are realistically and beautifully drawn. Arlo the Armadillo's adventures in Paris cover all the top spots such as the Louvre, the Champs Elysees, and the Arc de Triomphe. He discovers the macarons of Paris which are the colourful, light cookies filled with ganache. He rests on the beautiful Pont Neuf. Arlo has his portrait painted on the banks of the Seine. He searches for the mysterious Iron Lady. And of course he finds her to his delight! This picture book has considerably longer text than many current releases, and uses a blend of third person narrative with journal entries from Arlo's grandfather Augustine. The page designs, overhead perspectives, muted palette with occasional intense colors,and are that is both sketchy and intensely representational are perfectly suited to the fun but somewhat bizarre premise of an adventurous armadillo exploring many appealing features of Paris- very realistically presented! It's a winner on m This picture book has considerably longer text than many current releases, and uses a blend of third person narrative with journal entries from Arlo's grandfather Augustine. The page designs, overhead perspectives, muted palette with occasional intense colors,and are that is both sketchy and intensely representational are perfectly suited to the fun but somewhat bizarre premise of an adventurous armadillo exploring many appealing features of Paris- very realistically presented! It's a winner on many counts, but will not appeal to every audience. Now I need someone who is actually an artist to explain to me why Arlo reminds me so much of a croissant! Arlo is an armadillo from Brazil who travels to and around Paris, France with the help of his grandfather's postcards. He is told of the Iron Lady and throughout his adventure of major landmarks in Paris, he is told all about the Iron Lady. Arlo cannot wait until he meets the Iron Lady after hearing all about her and in the end he comes face to face with her, The Eiffel Tower. I absolutely love this book. Good for pairing with a geography lesson as well. It is very informative and also adventurou Arlo is an armadillo from Brazil who travels to and around Paris, France with the help of his grandfather's postcards. He is told of the Iron Lady and throughout his adventure of major landmarks in Paris, he is told all about the Iron Lady. Arlo cannot wait until he meets the Iron Lady after hearing all about her and in the end he comes face to face with her, The Eiffel Tower. This is a sweet tale about a grandfather's travel journal, written to his grandson, Arlo. Each page takes the reader to a different location in Paris. Arlo follows his grandfather's directions, enjoying the sights, sounds, and tastes of Paris along the way. The oil and graphite illustrations are very nicely detailed and Arlo is adorable. Arlo eventually finds the Iron Lady, mentioned frequently in the journal pages. And the entire journey is from just one of the travel diaries, leading me to believ This is a sweet tale about a grandfather's travel journal, written to his grandson, Arlo. 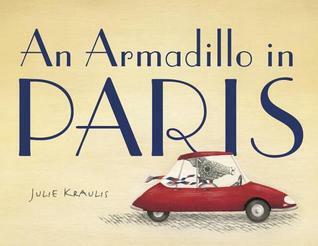 Picture book of a dear armadillo named Arlo who goes to Paris. He has his grandfather's travel journal to guide him through the city as seen through the eyes of the "Iron Lady." I loved the illustrations and the notes from grandfather were fine but I felt the other paragraph of text on each page was unnecessary as they basically describe the action on the page. I have a feeling Arlo will probably be going on further adventures and I look forward to traveling with him. Beautifully illustrated and a great introduction for kids to Paris and the Eiffel Tower. I read it with my 7 yr old and he quite enjoyed not only the story but the facts at the end. I do believe he will be quoting them to anyone who will listen soon. An extra cute detail is that the jacket makes a great little poster. Full disclosure I did receive this copy as a giveaway, definitely one we will be reading again and again. I adore the illustrations in the charming story about an armadillo who follows the path his grandfather took many years before on his adventure through Paris. Arlo the armadillo is on a hunt to find the Iron Lady and visits a handful of other historic and iconic Parisian landmarks. Kids of all ages will hear something new about the wonderful city and a few may be inspired to follow their feet on their own adventure! Recommended for children 5 - 10 years old. If an armadillo can go to Paris, we can all go. Arlo is such an armadillo, and he’s following in the footsteps of his adventurer grandfather Augustin. Augustin oh-so-kindly made Arlo a series of journals (sequels?) about his favorite places in the world, and now Arlo is of an age that he can visit these suggested places himself. And so he does, and what a lovely visit it is. Take me away, Augustin and Arlo! The illustrations are superb. They were so detailed and had an airy quality that I loved. The formatting for the Kindle left something to be desired, however. I would not recommend this one as an e-book until the kinks are fixed. The writing is a bit wordy and challenging for younger readers, but it would make a fun read-aloud. This would be a great book to share with young children preparing to visit Paris. I mostly enjoyed seeing all of the landmarks that were highlighted, having recently been to them myself. The writing style and the story line are not all that captivating-- but the enchanting illustrations do make up for it. The illustrations are charming, but the story didn't grab me as much as I think it could have. I liked the merging of fiction and nonfiction, helping children learn about Paris locations and culture, but its appeal may be limited as a result. The vocabulary/facts at the end are helpful. Thank you to the publisher and NetGalley for providing a free e-galley of this book. Arlo the armadillo explores Paris via letters from his grandfather that direct him around the city. Also to spice things up with a myserty, his grandfather keeps alluding to The Iron Lady as Arlo slowly makes his way to find out who she is. The illustrations are wonderful and the reflection of the Louvre pyramid in the water is gorgeous. "Arlo feels it. The twitch in his left claw. The twitch that only stops when adventure begins ..."
See the sites of Paris while searching for the "Iron Lady" as described by Augustin, his grandfather. I adored this clever book about an Armadillo following his grandfather's travel journal entries to discover the most famed landmark of Paris. I will definitely purchase this book for my personal collection. This book was provided by Netgalley and the publisher for an honest review. Thank you. Arlo is a wonderful character that made me smile. Thank you for the opportunity to read this book...I loved the images of Paris, the illustration was wonderful. This is a precious book for both children and adults. A wonderful way to familiarize oneself with Paris and for those who have been it will make you reminisce. Arlo is adorable and he takes on Paris with a true spirit of adventure. This book accentuates my love of Paris! What a lovely adventure for an armadillo to have as he searches the city for the Iron Lady. The book is filled with information about Paris and the many sights there are to see, lovely images, and a fun main character. Great book for studying landmarks of Paris. Cute story. I adored the illustrations. This book is a nice introduction to Parisian landmarks that my elementary students can research in more depth. Lovely book.